Palatinose by LiveLong Nutrition at Bodybuilding.com! - Best Prices on Palatinose! Palatinose has a sweetness about half of sugar. Best of all, it tastes like real sugar instead of artificial sweeteners like sucralose or aspartame. Even with its incredible taste, Palatinose has a unique structure that makes breaking it down into energy take much longer than regular sugar (sucrose). This affords the athlete a time-released, constant stream of energy. It is completely absorbed, and slowly hydrolyzed (the process of breaking down sugar is known as hydrolysis), so the athlete gets the needed carbohydrate to power through metabolically intense workouts, without the crash associated with other sugars. Many of our customers also prefer a “real” sweetener versus aspartame or sucralose, both due to a more authentically sweet taste, as well as its usability in baking recipes. Other sweeteners don’t handle the heat of baking quite like real sugar and Palatinose does. 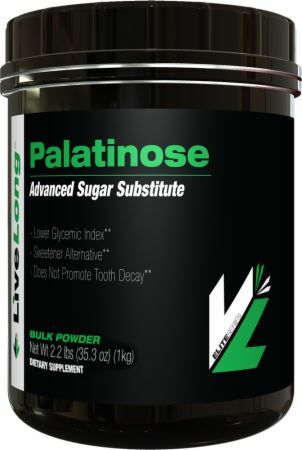 As an added bonus, Palatinose does not promote tooth decay like regular sugar since the sugar is not an immediate source of energy for the bacteria present in the mouth. At the heart of what makes Palatinose different from other sweeteners is its unique structure which requires several key metabolic steps in order to release the glucose to use for energy. Adding a serving to an electrolyte drink will give it a sweetness that satisfies, and yet the slow release of glucose will give the athlete a beneficial steady rise in blood sugar levels, instead of the typical crash that occurs with other sugar sources, even maltodextrin. If you need a slow released carbohydrate that will give extended energy benefits throughout several hours, then Palatinose is the right choice for you. No other sweetener on the market can give the same sweetness while also delaying fatigue and providing a steady stream of glucose to power through long workouts or athletic activity. Many of our customers have found Palatinose to be a great substitute for sugar in baking. Now you don’t have to skip out on the real sweetness of sugar while trying to maintain good health and maximize your leanness. Many report using about twice as much Palatinose to regular sugar in order to get the right amount of sweetness. Adjust to your preference. Add a scoop of Palatinose to your next preworkout protein drink if extended endurance is important to you. If you are trying to maximize muscle gains, consider sticking with maltodextrin or another similar fast-acting sugar. While watching your waistline, add it to your shake and enjoy the benefits. I have used this in the past. I was actually fully keto and monitored my blood sugar and ketone levels before and after training, before and after introducing this. It stabilized blood sugar throughout my workouts but did not break ketosis. Its an excellent alternative for keto athletes who pay far to much for superstarch. Highly recommended. Directions For Palatinose: As a sweetener, use one scoop (10 grams) as an equivalent sweetness to sugar. Add or reduce to taste.